Instant noodles have played a large role in my life. 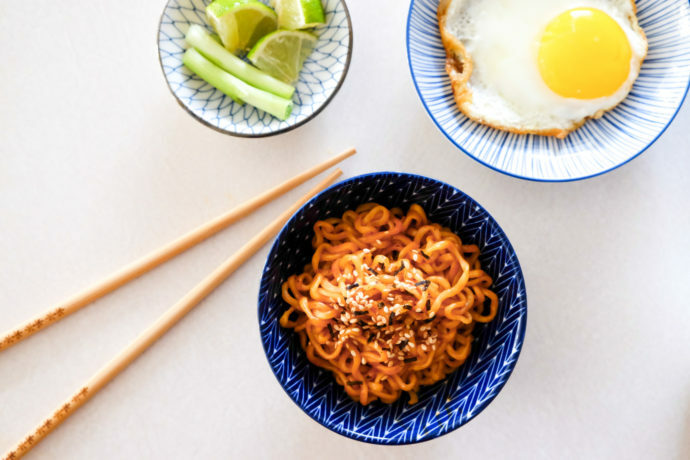 As a young child I would grab Mama packages, smash the dry noodles and toss it with the dry condiments – a quick and easy snack. In college, these I’m-living-off-student-loans budget friendly packages kept me going through those late nights. I’ve recently started a FT job in urgent care… and learned real quick that cooking wasn’t at the top of my to-do list after a 10-hour shift. Although it may be sodium packed and possibly (ahems, most likely) not the healthiest choice, instant noodles have always been my go-to comfort food. 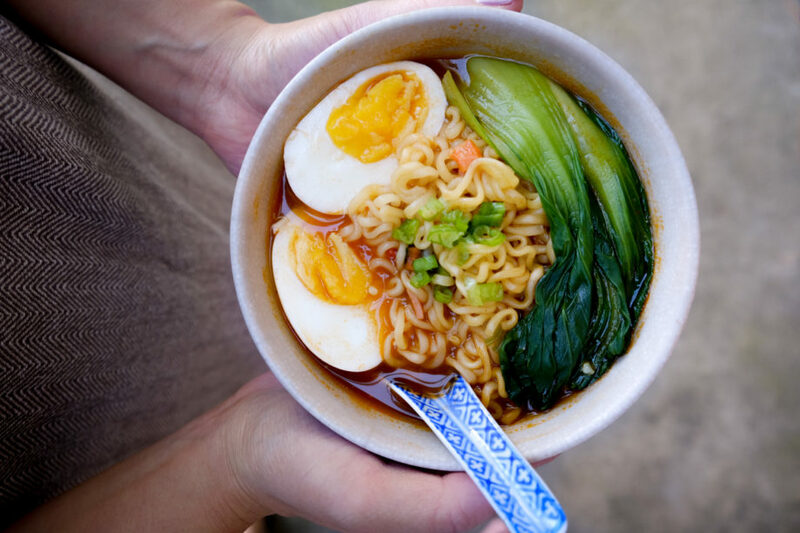 Not only are instant noodles so quick and convenient to make, but there are so many ways to eat them! There are soups, stir-fried dry varieties, and the toppings are limitless. I love adding green onions, bok choy, and eggs to my noodles. Best way to cook the eggs? Either half boiled, cracked directly into the broth (right before noodles are done cooking), or fried sunny-side up. The only downside to all of this is deciding which noodles to try! I love going to Park to Shop Marketplace or Saraga International Grocery for their wide selections. 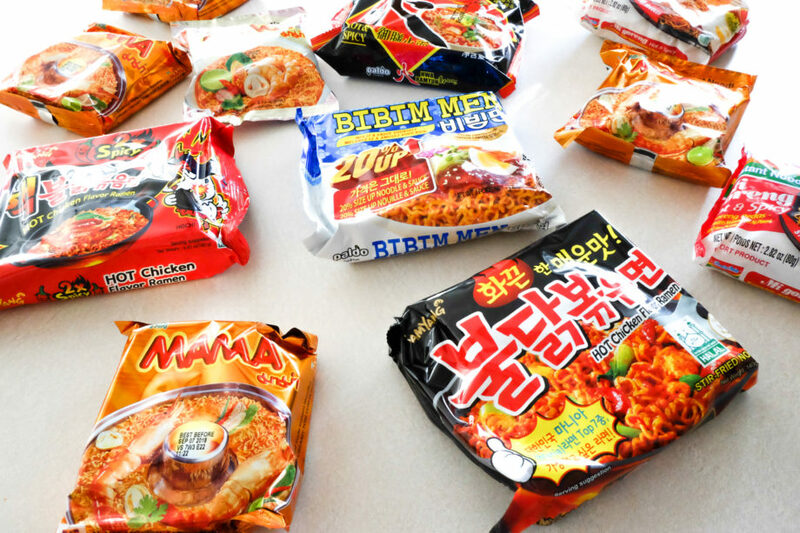 My pantry is always stocked with this Korean classic staple. I personally prefer cooking the noodles al dente for a chewier texture. The portions of one package are satisfying! Well, two serving sizes… but who is counting? Vegetarian friends gather round, because this one is a vegetarian friendly Korean ramen. Kathy recently introduced me to this, and the broth is slightly less acidic (compared to Nongshim) but jam packed with flavor. I actually prefer these noodles over the Nongshim! But both are very similar in both texture and taste. This one is a family favorite. I remember eating these uncooked (as mentioned earlier) and cooked with so many different toppings as a child. My favorite flavor is the original shrimp tom yum flavor! I love adding fish balls, tofu, veggies, and so much more. Bibimen Noodles were a college staple for me. 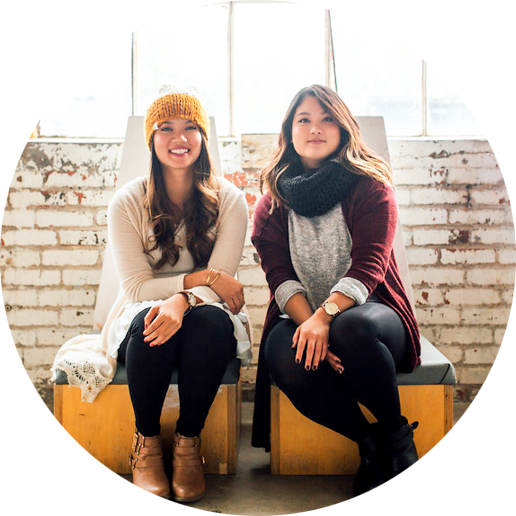 I remember having it for the first time on the third floor of 18th Avenue Library, formerly known as SEL. My friend packed a plastic container full of drained plain noodles, one half-boiled egg peeled, and a packet of sauce. My curiosity and hunger glanced over the table. I watched her pour water into the noodles, microwave it, and mix in the sauce. She offered to share her lunch, and I was hooked. The sweet and salty sauce was perfect and I loved how the noodles were thinner yet substantial. She still cooks Bibimen for me to this day, that’s probably why she is one of my bridesmaids. I’ve been seeing these noodles on TasteMade and spicy ramen challenge videos – this did not disappoint. These are a definite must for heat-seekers. The heat is intense, yet subtle at times from the sweetness. As soon as the heat kicks in, I’m ready for another bite. It’s addicting. There’s also another version in a red package labeled as “2x Hot Chicken Flavor” which I found to be overly acidic. Per Wiki, these stir-fried noodles have a cult following in Indonesia, Nigeria, and Australia. I can taste why. Kathy’s favorite flavor is Fried Noodles (original) while I love the Hot & Spicy. 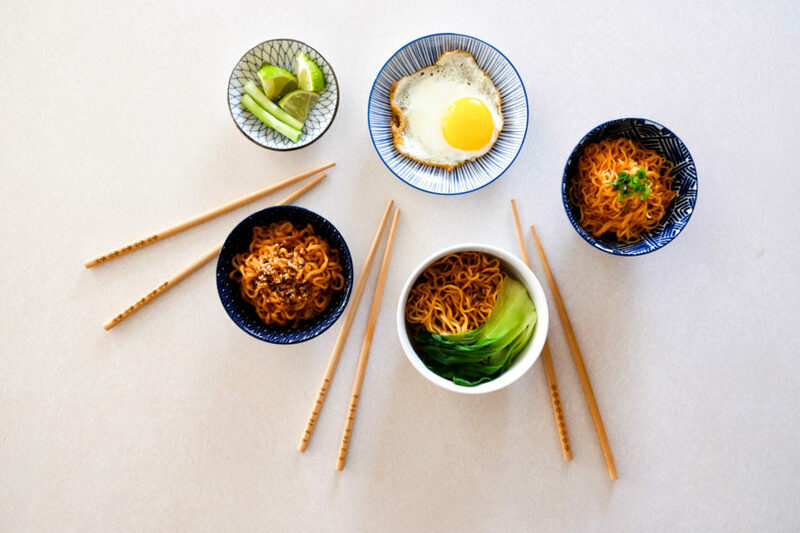 These noodles pair perfectly with fried eggs. Also one squeeze of lime and a touch of fried shallots doesn’t hurt! I love everything lime. I love squeezing fresh lime on almost everything, including every instant noodle mentioned in this post. The acidity of the seasoning is perfect. The only fault I can find about them? Portion size – because apparently I need to learn what portion control is… ha! There are so many other flavors to try, but I keep coming back to the same tried-and-true ones. Does anyone else have a favorite brand/flavor that I’m missing out on?! We will have to try that Laksa one out! !